Some people seem to have a knack of getting into trouble or upsetting those around them. The power-hungry boss, the evasive colleague, the clingy friend and the suspicious neighbour are all individuals we recognize from our day-to-day experience. Dealing with them is often tricky, but if we could only understand why they act the way they do and see the patterns in their behaviour, we might stand a better chance of coping with their idiosyncrasies. That’s Just the Way I Am was written to answer this need. Through clear everyday language and sharp, witty cartoons, it sheds light on a range of different personality types, from the narcissistic through the compulsive to the eccentric. It shows that some personality traits can be an asset in certain jobs and environments, while others can be the cause of lasting suffering and distress. 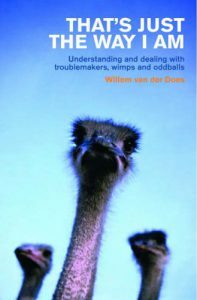 And it offers useful tips on handling the awkward and complicated individuals – the troublemakers, wimps and oddballs – that most of us encounter from time to time in our professional and personal lives.